If your neighbour did something that absolutely infuriated you, how would you react? Most people would cut ties or build a tall fence. One man in Virginia City, Nev., however, purchased the land on the other side of his enemy and built a large house just one foot away, blocking his neighbour’s view and restricting the ventilation on that side of the neighbour’s house. The idea of spite homes isn’t new. In 1830, one cranky individual in Virginia constructed a building just seven feet wide to prevent strangers from using the alley next to his house. In 1814, meanwhile, a doctor in Maryland quickly built a mansion so that the town couldn’t construct a road through his property. In Vancouver, spite is the reason the city is home to the world’s shallowest commercial building. The city expropriated 24 feet of existing property from the Sam Kee Company, which owned a standard-sized lot that featured retail space on the ground floor and living quarters above. The remaining space was wide and shallow, and many people thought it was unusable. But the owners decided to go ahead with their construction plans, and now these shops are just five feet deep. 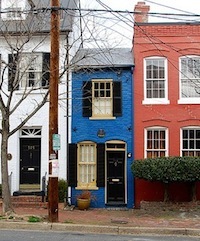 Not all spite houses are necessarily bad. The Westboro Baptist Church has undoubtedly angered a lot of people with its extreme anti-gay stance, its picketing of military funerals and its belief that U.S. President Barack Obama is the Antichrist – to name but of a few of its controversies. 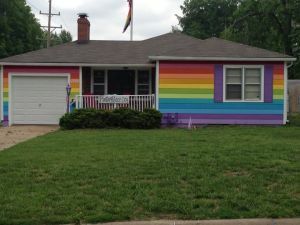 So, in the best spite house case we can find, the non-profit group Planting Peace, which advocates for equality, runs orphanages and conducts various human rights campaigns across the globe, purchased the house directly across the street from the group’s headquarters, and painted it in the colours of the Gay Pride flag. The Equality House, as it’s now called, is a resource centre for the LGBTQ community and a strong symbol of peace and positive change.